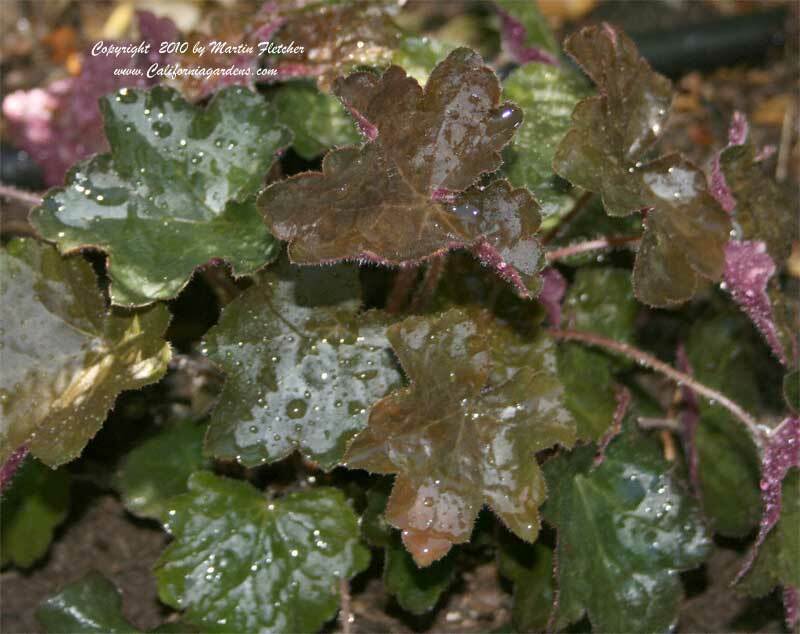 Heuchera Palace Purple is a selection from Heuchera micrantha diversifolia. The Crevice Alumroot is native to the coast ranges from San Luis Obispo County through Oregon, other varieties of this species continue through to British Columbia. The Crevice Alumroot is somewhat drought tolerant once established, but is native to a higher rainfall regime than most of Southern California. Heuchera Palace Purple grows in full sun near the coast with regular water but seems to do its best in partial to full shade. Heuchera Palace Purple grows 1-2 feet tall and wide, including the flowers. The Crevice Alumroot has creamy white blooms in the Summer. Heuchera Palace Purple is Winter hardy into the single digits. Purple foliage of Heuchera Palace Purple - Crevice Alum Root. High resolution photos are part of our garden image collection.